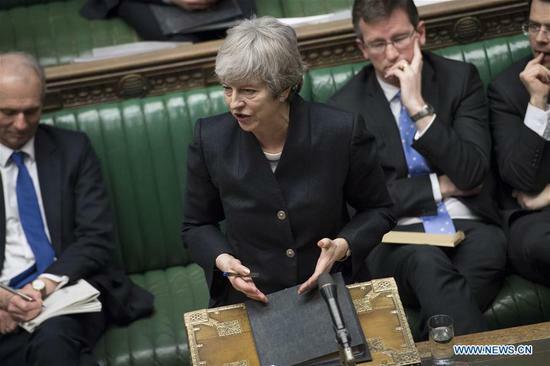 May, who returned in the early hours of Thursday after lengthy and difficult talks with EU leaders in Brussels, addressed a crowded chamber in the Houses of Parliament to report on the outcome of her talks with the EU Council. The European Council agreed to a six-month extension of the Brexit process early on Thursday morning, setting a new deadline for the United Kingdom to leave the European Union on Oct. 31, 2019. May had wanted an extension until June 30 in the hope Britain could avoid taking part in European Parliament elections. May told MPs she deeply regretted having to accept the six-month extension from the EU, which she never wanted to seek. She said Britain has now been provided with the time necessary to finally break the Brexit impasse, telling MPs: "The choices we face are stark and the timetable is clear." May said she was still pursuing an orderly departure from the EU, insisting there was still time for MPs to agree a deal to avoid Britain taking part in the EU elections. She said the deal would allow Britain to leave earlier than October if parliament backed a deal. May told MPs the whole Brexit debate was causing uncertainty across the country and needed to be resolved. "The clock has run down and Britain has been left in limbo," he said. Rebuffing the resign call, May said she had voted three times in favor of the Brexit deal, but the House of Commons had voted against it. The leader of the minority Liberal Democrats, Vince Cable asked May to put forward a timetable for when a second EU referendum, the so-called People's Vote, could take place, if MPs voted for it. May, who has always insisted the result of the 2016 referendum decided the issue, said the government's position on another vote hasn't changed.